They are a layer of red velvet brownies (I could stop here and be satisfied but what’s the fun in that) with an Oreo truffle layer (I know, the inside of Oreo truffles..) topped with chocolate and mini chocolate chips. Yes, Oreo truffle! 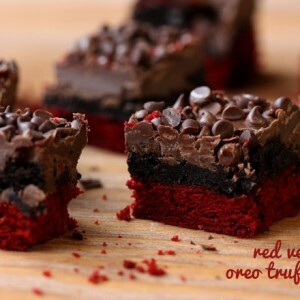 As in, the filling in addictive Oreo truffles spread out across red velvet brownies. Sinful. Sultry. Perfect. Spray a 9x13 with nonstick cooking spray. I like the baking variety that has flour in it. Then spread the red velvet brownie layer into the pan. It will be VERY thick, use the back of a spoon (or clean hands) to help spread it into all edges of the pan.